DataColor's website states: "From capturing images to digital editing and printing your work, you can rely on consistent, accurate color throughout your studio and digital workflow with Spyder3Elite™. 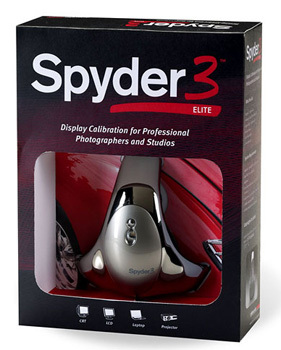 Designed for the way photographers work, Spyder3Elite is the next generation in calibration accuracy, precision and speed, allowing you to create profiles to your specifications and bring a new level of color control to your work." 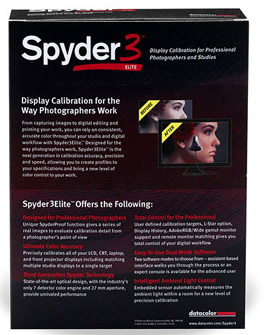 The Spyder3Elite comes packaged as shown above, and includes the hardware colorimeter device itself, a desktop cradle mount, software installation CD, screen cleaning packets, a quick start guide, and a 2 year warranty. 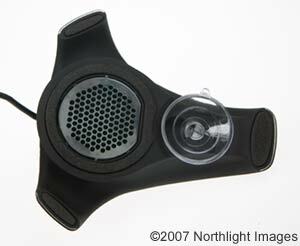 The device itself is attractively designed, and finished in a reflective silver plastic. 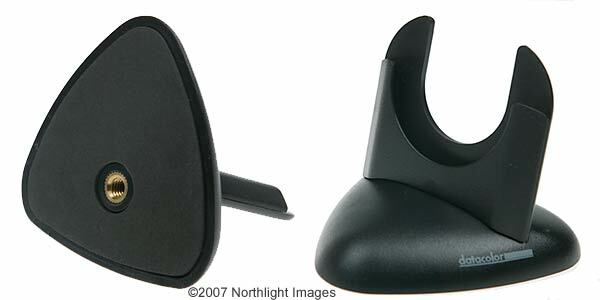 On the back, there is a decent sized suction cup for attaching to hard coated displays, and you can see the sensor aperture also. The device feels a little more sturdy, and certainly less bulky, than the Spyder2Express did, and is well built. The cradle is reasonably weighted, and holds the colorimeter well. The cable is nice and long (maybe even too long in fact) to connect the device via USB to your PC, and there is a sliding counterweight which is of a decent weight, and reasonably easy to position along the cable. 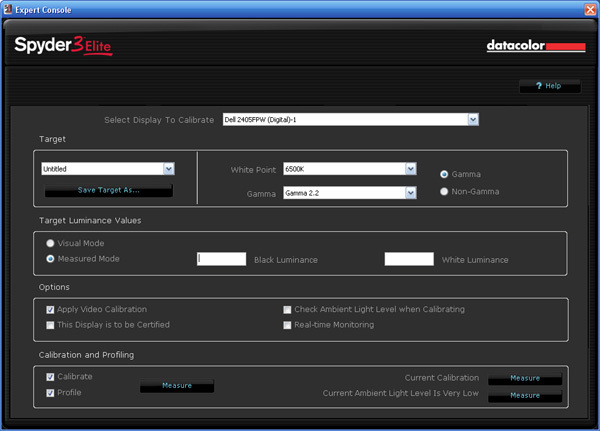 The aim of this review is really to discover how effective the Spyder3Elite device is in calibrating monitors. We shall use the highly regarded and effective LaCie Blue Eye Pro device, and software package as a control in these tests. This will allow us to verify and compare the results of the calibration process. I will use the reporting feature of LaCie's software, which will show us several things, including luminance, gamma and colour temperature values reached by calibration. Perhaps most importantly, it will also show us the DeltaE (dE94) values for 16 colour shades, helping to show us how accurate the colours shown on the screen are. During the calibration process, the RGB settings in the OSD were altered to 32, 34 and 34 respectively, and brightness was set at 35%. The automatic calibration process alters values at a Look Up Table (LUT) level and produces the above report to validate the results. 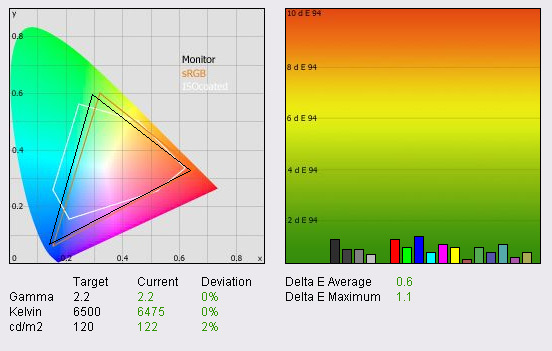 On the left hand side the CIE diagram shows a triangle representing the monitors colour space, its gamut. 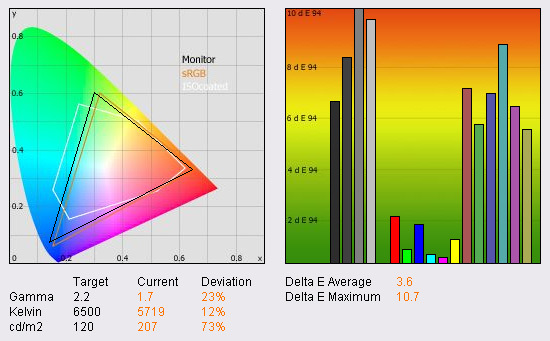 In this case the Dell 2405FPW covers pretty much the sRGB colour space and represents a coverage of 72% of the NTSC colour space. Some modern displays offer enhanced W-CCFL backlighting capable of offering a larger colour space, typically covering 92% of the NTSC gamut. 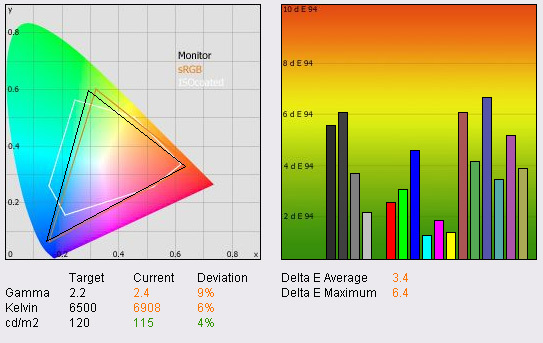 Below the CIE diagram the gamma, colour temperature and luminance of the screen are shown in turn. We aim for a gamma value of 2.2 which is the default for computer monitors, and the standard for the Windows operating system and the Internet-standard sRGB colour space. After calibration, the screen matches this exactly. The colour temperature we aspire to is 6500k, the temperature of 'day light'. 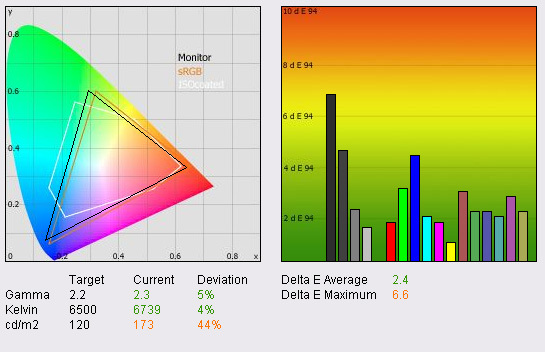 The screen is correctly calibrated to 6475k, hardly any variation from the desired value. Lastly we aim for a luminance of 120 cd/m2 which is the recommended luminance for an LCD display in normal lighting conditions. Again, the screen is corrected within 2% of this luminance, and is calibrated to 122 cd/m2. Black depth was also recorded at a decent level of 0.17 cd/m2 and this gave a usable contrast ratio of 718:1. After calibration, the Dell 2405FPW showed very good colour accuracy with an average DeltaE of only 0.6, and a maximum of 1.1. LaCie would consider the colour fidelity to be excellent. So the above shows what the screen is capable of with correct calibration. I then returned the screen and graphics card to their default settings and tested again. The RGB levels in the 'user' menu of the OSD colour control were now all set at 50, and the ICC profile created during our initial calibration was discarded. Brightness in the OSD was also now back at a level of 50%. At default settings, the performance of the screen was far from ideal! Gamma was poorly adjusted to 1.7, colour temperature was recorded as 5653k and luminance was far too high at 242 cd/m2. With a black depth of 0.27 cd/m2, this gave a contrast ratio of 896:1, a little shy of the specified 1000:1 for this display. When you install the software the Spyder3 Utility is put into your system startup providing system tray access to several options. These include the option to enable or disable the ambient light and calibration monitoring facility. You can also launch the main application from the system tray icon if desired. Once you load up the software you can enter the preferences option as shown above. You can choose the sensor you are using, and set a recalibration reminder time scale to suit your needs. The advanced options also allow you to chooce the user interface detail (I stayed on advanced for this review so I can play with all the options and features). You can set a DeltaE warning level as well. As a reminder, LaCie would consider a DeltaE reading of <1 to be excellent colour fidelity. You may want to consider a more lenient setting however, dependent on your display and your requirements, and taking into consideration how successful this calibration process actually turns out to be. You can also select the ICC settings where you can choose to create ICC Profiles that meet version 2.0 or 4.0 of the ICC Specification. The default value is 2.0. Version 2.0 profiles are compatible with all applications and Color Management Modules (CMMs). This is the appropriate choice for most users. Version 4.0 profiles include the Chromatic Adaptation tag (‘chad’) and have their Media White Point tag (‘wtpt’) set to D50. Additionally the header contains a valid MD5 “fingerprint” for the Profile ID. I stuck with v 2.0 here. The chromatic adaptation mode can also be altered if desired. When recording colorimetric values in a profile, XYZ values need to be chromatically adapted from their measured color space to the D50 color space that is used by the ICC profile. There are different adaptation algorithms that can be used to perform this computation. The Bradford transformation is recommended by the ICC Specification and other sources as being the best adaptation method to be used. This is the default value. 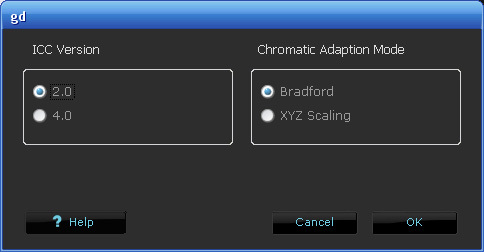 Many other monitor profiling applications use the XYZ Scaling algorithm for chromatic adaptation when creating ICC profiles. 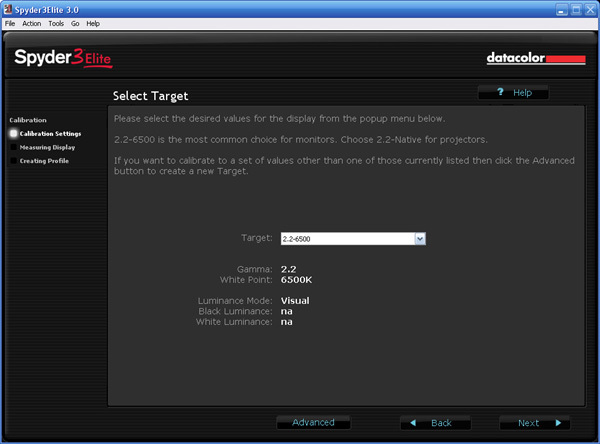 Within the go > select target options you can define your target gamma / colour temperature. We have left this with a target of 2.2 for gamma and 6500k for colour temp. There is also an option for ambient light compensation, which allows the device to detect the room conditions and adjust the target calibration values accordingly. I left this option 'off' as it recommends, since I still want to aim for 2.2 / 6500k. There is also a further, more sophisticated settings section available via the 'Action > Expert Console' option. In here you can independently select gamma and white point (colour temperature), along with a target black and white luminance. For this test I will set a target black depth of 0.00 cd/m2, and a target white luminance of 120 cd/m2. The other options are shown above, and there is access to measure the current calibration and current ambient light conditions. When you first load up the software it detects your display which is connected, and prompts you to make a few settings before you attempt calibration. You can choose what type of display you are calibrating, with support offered for LCD, CRT, projector and laptop. 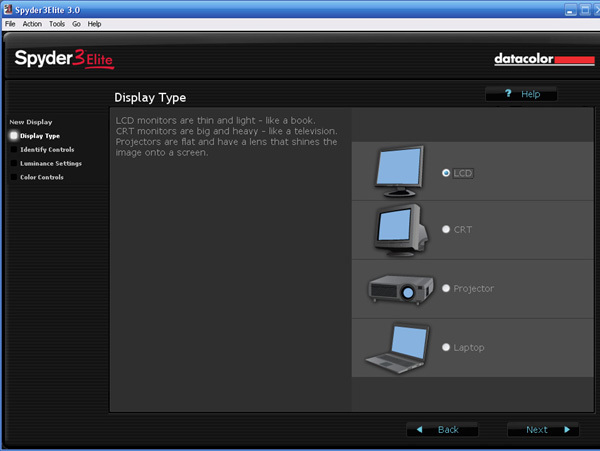 You can select which controls exist on the display for brightness, contrast and backlight (here with my control display, the Dell 2405FPW offers only brightness control when connected via DVI). The process then guides you through several steps, including the suggestion that brightness control and black luminance (if you have this setting) should be left at factory default levels. 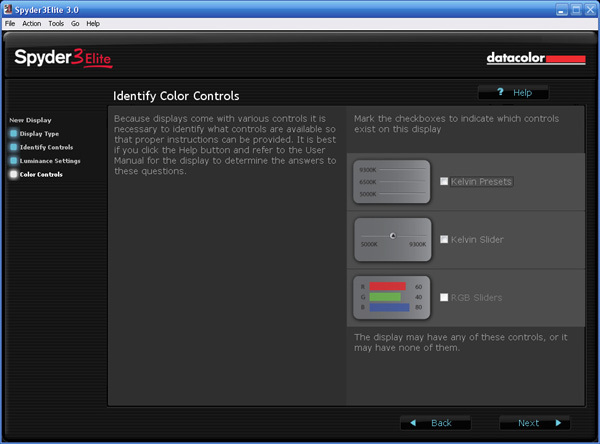 You can then identify which colour controls are available via the monitor itself. Here I selected access to RGB sliders. You are then given some guidance as to whether you should use the suction cup for the display you have. I opted to remove the suction cup which comes off easily enough, and instead position the device flat against the screen, balanced thanks to the counterweight. Before calibration begins, you are given access to your preferred target settings if you need to check them. You can also test the 'current calibration'. I followed this process which takes about 1 minute to complete. The device measures the ambient light, before measuring red, green, blue, black and various grey values. The results are then presented to you as shown above. Here, the Spyder3 device showed that gamma was 1.79, and was close to what as we had recorded from the LaCie device a little earlier. Black depth was recorded at 0.31 cd/m2, which was a bit high when you compare to the 0.27 cd/m2 recorded by the LaCie probe. White level was also recorded at a slightly higher 249.4 cd/m2, whereas the LaCie tests had measured 242 cd/m2. All in all though, the current calibration testing was pretty much in keeping with the results we see with our control colorimeter, so you can be fairly confident in the Spyder3's ability to measure your display settings here. After this stage the software guides you through the automated measurement stage which takes approximately 30 seconds. This then shows you some results with the discrepancy in colour levels, colour temperature and luminance shown on the right hand side. Here we saw a 0.88 Dab difference (whatever that is!) 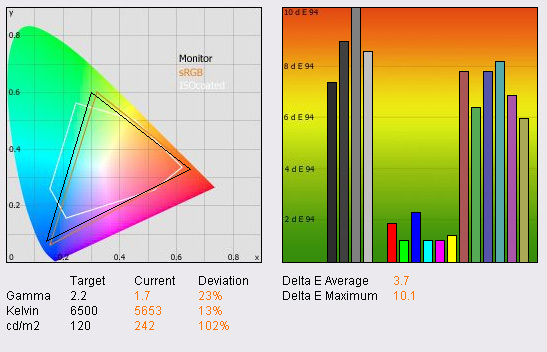 in colour levels, colour temp was measured at 5600k, and luminance was now listed at 251 cd/m2. You are told to adjust the OSD settings for RGB levels, along with the brightness setting. After each adjustment, you need to press the 'update' button to refresh the stats on the right, with the aim being to get the three coloured bars to be even, and within the target zone. The Dab difference reading should also be < 0.5 you are told. You also need to get the luminance value to your desired level, and we are aiming for 120 cd/m2 here. Firstly, the software is set up to be full screen, with the measurement square being located in the centre of the screen. This can be a bit of a pain if you are operating the OSD, since this invariably pops up in the centre of the screen as well, and could get in the way of your measurements. Fortunately I could change the horizontal position of the OSD menu on the 2405FPW. I found that adjusting the brightness was difficult as well, since a lot of the luminance correction is probably needed at a LUT level. I adjusted the OSD setting from 50% to 30%, since this was an improvement to ~180 cd/m2, and a setting I knew to be pretty good from calibration with the LaCie device. 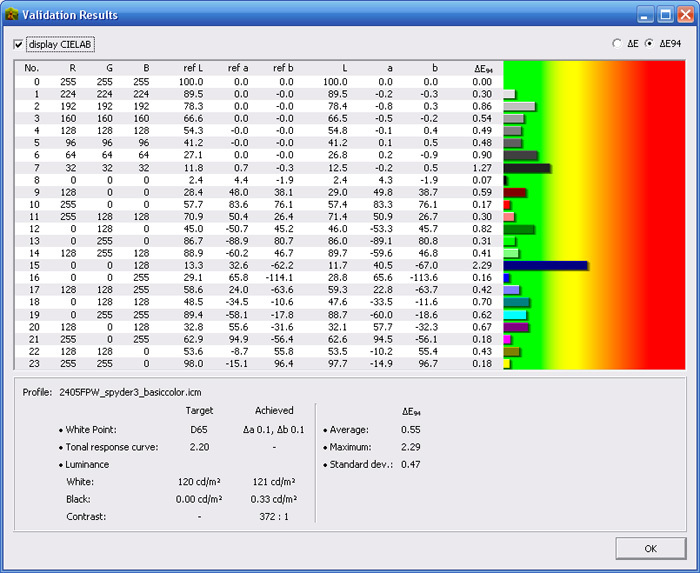 RGB channels were adjusted to 38, 39 and 62 respectively. I would rely on the device changing things at a graphics card level from here on! The above screen shot shows that after some OSD adjustments, the colour temp was good at 6530k, the 'difference' was listed at 0.03 and luminance was improved somewhat. The next stage is again automated and calibrates the screen for you. This process takes approximately 5 minutes on the first occasion, perhaps a little long I felt, but not unexpected given the time is listed in the product specs. 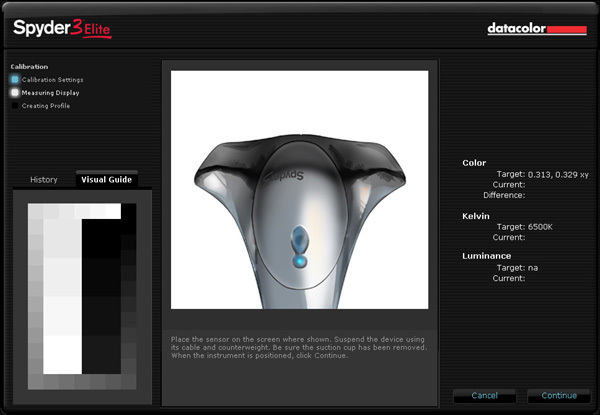 A series of red, green, blue and grey shades is flashed in front of the probe, and at the end, an ICC profile is created which you can name and save. The 'SpyderProof' facility at the end of the calibration process allows you to quickly switch between the standard, and calibrated settings to see what difference has been made by the process. This is a fairly quick and easy way to see your results, but relies on the human eye to see it. After this was complete, I was eager to go through the calibration check facility again in DataColor's software. This produced the above result, where gamma was now corrected to 2.25, and white point was nearly spot on. Luminance remained at 178.5 cd/m2, a little way off the specified 120 cd/m2 we were aiming for. An improvement from the default monitor settings, but no real improvement since we adjusted the OSD brightness control during the first stage of the calibration. Black level was also recorded at 0.27 cd/m2. The Spyder3 software also has a couple of other reporting features, one of which is the 'curve's diagram shown above. 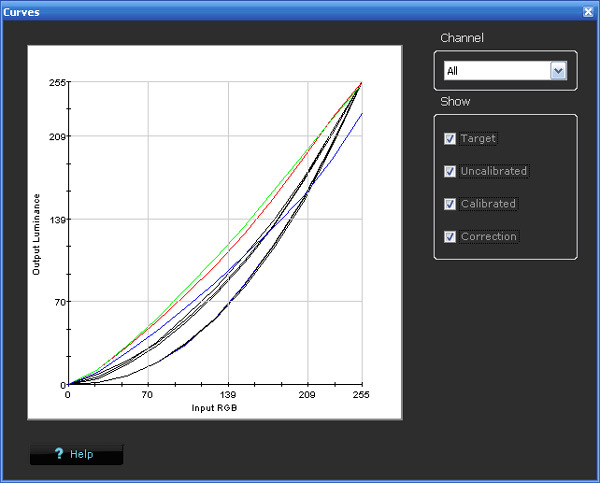 This shows the target gamma curve, along with what the device has recorded at your uncalibrated and calibrated settings. Here, the calibrated result was very close to the mathematical ideal gamma curve. The other reporting features built into the software include the 'information' and 'validate' functions. Firstly I ran the validate process which takes about 45 seconds and gives you a very quick and basic DeltaE summary as shown above (left). 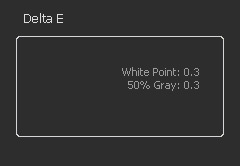 This suggests that white point dE and 50% grey dE were both 0.3. There was no further information provided, and there was no analysis of different colour shades like you would see from higher end software such as LaCie's. We will have to wait to analyse with the LaCie probe to see how colour accuracy was affected. The second reporting feature shown (right) is the 'information' screen. 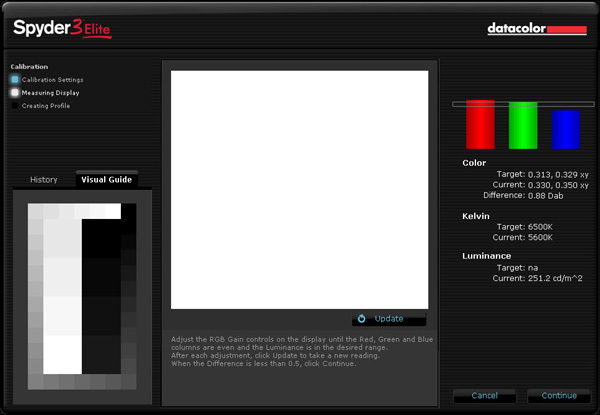 This shows you your white and black luminance values, before and after calibration. 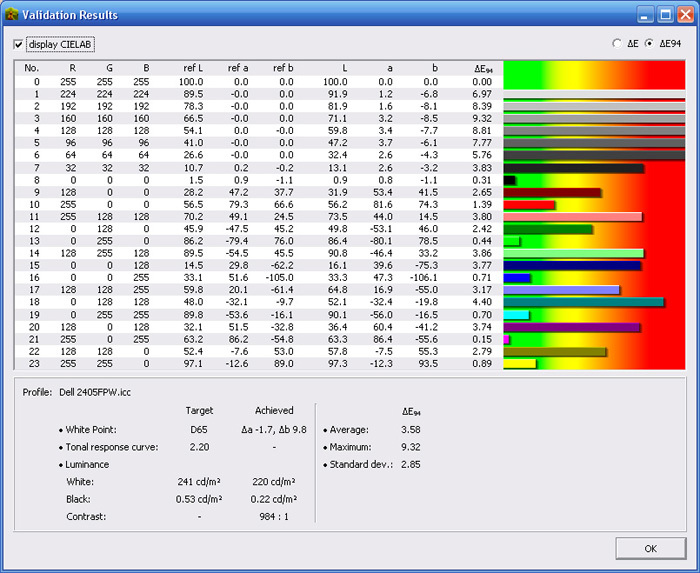 Note that the 'before' reading is based on the measurement during the calibration process, after OSD brightness is adjusted. 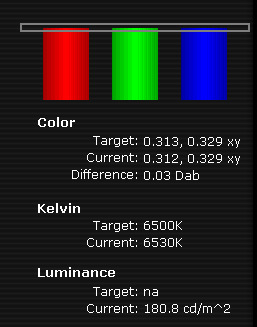 As this information screen shows, the luminance (white) was not really corrected any further towards the desired level after LUT-level calibration. dE values are taken directly from the 'validate' function, and gamma values are shown before and after the calibration process. This is a reasonably handy snapshot of what you have achieved with their process, and nice to see from the software. LaCie's software revealed the above analysis once the screen had been calibrated with the Spyder3 package. Gamma was adjusted from the default 1.7 value, to be close to the desired 2.2, but remained 5% out at 2.3 (note this could well be rounded up from 2.25 as recorded from the Spyder3 validation above). Colour temperature was close to the desired 6500k at 6739k, but still remained 4% out (improved from 5653k at default settings). Luminance was too high as we knew from the Spyder3 validation, and LaCie's probe recorded this at 173 cd/m2, which was still an improvement from the default 242 cd/m2. One thing to note is that this was very close to the Spyder3 analysis, which was a pleasing sign, and shows the Spyder3 package is capable of some pretty good analysis of your monitor set up. The graph on the right shows that DeltaE values were improved considerably from the default settings shown earlier on. On average, dE was now 2.4 (improved from 3.7) and LaCie would consider colour fidelity to be quite good, but still with some variance in the requested and displayed colours. Maximum dE was now 6.6, rather than 10.1 as recorded at default settings. If you look back to our review of the Spyder2Express from last April (same control screen and tests), you can see that the Spyder3 has done a better job at correcting the colours than its predecessor did. In that test, dE was only corrected on average to 3.4 (max 7.2). Gamma, colour temp and luminance were also corrected to a lesser extent than the newer model managed. The above tests show that there were some nice improvements made by the Spyder3 calibration process, with gamma and colour temp being corrected very well for a start. dE was improved quite nicely, but not to the degree we can achieve with other colorimeters. The only main area which was difficult for the device to correct was the luminance. Adjusting the OSD brightness control to 30 helped somewhat, but there was no further LUT-level adjustment it seems. This was also a weak point of the Spyder2Express package we have tested from Datacolor in the past. You would probably have to settle for adjusting the OSD to a comfortable level to get near to the luminance value you seek, and just leave the Spyder3 to improve gamma, colour temp and colour accuracy. I ran through the recalibration process to double check I had gotten the most out of the device. This process takes about 2.5 minutes. After which I ran the LaCie reporting feature and received results pretty much identical to the above. It appears I had done about as much as I could with the Spyder3Elite package here. 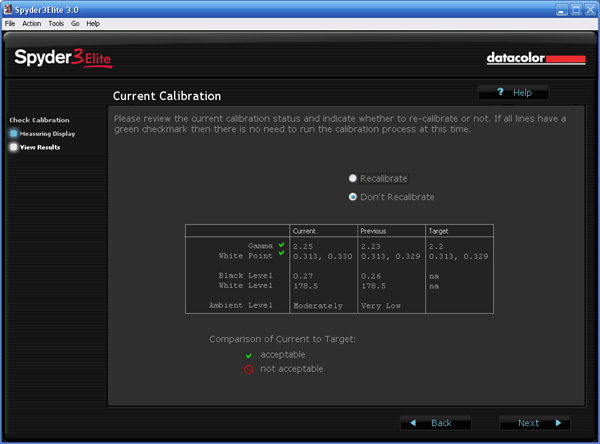 A question we get asked a lot by email and on our forum is: "how does x calibrator work with third party software?" We have already tested the Spyder3Elite package in full as above and the results are analysed in detail. However, it is possible to pair the hardware device with some third party software. We have the latest version of the complex BasICColour software (4.18) which now includes support for the Spyder3 device. Let's see if the device can offer any better performance with different software, or is it the hardware which is limiting the performance here? As we already discussed before, the default settings were quite a way out, particularly with luminance at 207 cd/m2 and gamma at 1.7. dE was 3.6 on average and 10.7 maximum. This is our starting point, and we already know from the above tests that only a certain degree of correction was possible using the Spyder3Elite package. Loading up the BasICColor software presents you with a whole range of calibration options which we will go into in more detail at a later date, with a full review. However, for now we will use their reporting feature which offers a similar analysis to LaCie's software. Again, leaving the screen and video card LUT at default settings, we measured the current performance. Their analysis was close to that of LaCie's software, and we again used the LaCie Blue Eye Pro probe here for initial control tests. Luminance was measured as way out at 220 cd/m2 and dE was 3.58 on average (pretty much the same as measured with LaCie's software @ 3.6) and 9.32 at maximum (close to 10.7 from LaCie). Again, this showed default settings would need a fair amount of correction. The great thing about the BasICColor software is that it can be used with the LaCie Blue Eye Pro device, and the Spyder3 hardware device. I thought it would be interesting to see how the Spyder3 hardware device measures the default settings as well, since we've already measured the screen using the LaCie Blue Eye Pro hardware device with 2 different software packages. The Spyder3 recorded similar results really on the most part, with luminance now recorded at 235 cd/m2. However black depth was measured at 0.31 cd/m2. Interestingly this was quite a difference from the LaCie probe which recorded black depth at 0.22 cd/m2. Perhaps the Spyder3 is less capable of measuring a black point? dE was on average listed at 4.78, max 9.91. Again perhaps it isn't quite as reliable at reading the dE values and reports a larger average discrepency. I connected the Spyder3 hardware and paired it with the BasICColor software to run through the calibration process. This should allow us to see what the device is capable of with a third party software suite. I ran through the process which is all automated and takes about 1 minute to complete, after first selecting 120 cd/m2 as the target luminance and 0.0 cd/m2 as the target black point. Gamma and white point were set to work towards 2.2 and 6500k respectively. OSD settings were not adjusted away from the defaults (50 brightness, and 50 for each of the RGB channels). Impressively the Spyder3 device was capable of making some good corrections to the screen using the BasICColor software according to the above analysis (see more later). Note that the above test and report was done using the Spyder3 as a measurement device as well, straight after the calibration was complete. Luminance was greatly improved to 121 cd/m2 and we never even altered the monitor's brightness here. Black depth was actually worsened according to the measurement with the Spyder3 device, and this was now recorded at 0.33 cd/m2. Was the Spyder3 hardware still having trouble reading black point? Colour accuracy was drastically improved as well, with dE average being only 0.55 (excellent colour fidelity) and 2.29 max. Testing the calibration results this time with the LaCie hardware device gave the above analysis. Luminance was measured to be pretty much the same as the Spyder3 device had recorded (114 cd/m2), but black depth was measured better at 0.23 cd/m2. dE average was measured at 1.90 instead of 0.55, while dE max was 3.75 instead of 2.29. Clearly there was some discrepency between what the Spyder3 device was measuring, and what LaCie's tool saw. If we load of LaCie's software again for some reporting, we get the above results. So as a reminder (as this is getting complicated! ), we have calibrated the screen with the Spyder3 hardware device but using the BasICColor software package. So after calibration there were some decent improvements. Luminance was well corrected, and dE was 3.4 on average and 6.4 max. Certainly an improvement from default settings, but calibration with the BasICColor software doesn't really offer much improvement compared with the Spyder3 software it seems. At default settings, the Spyder3 device shows some disparity in its test and report results when compared with the LaCie Blue Eye Pro hardware. Luminance is recorded a little too high, and black depth cannot be measured as accurately it seems. The Spyder3 also detected more variation in requested and displayed colours compared with the LaCie device. It didn't matter too much whether we used LaCie's own software, or the BasICColor package, but the LaCie device gave similar test and report results using both. 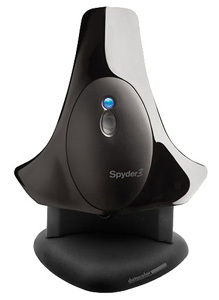 The Spyder3 hardware device is not particularly good at adjusting luminance when paired with its own Spyder3 Elite software. It was hard to adjust this to get anywhere near the required 120 cd/m2. 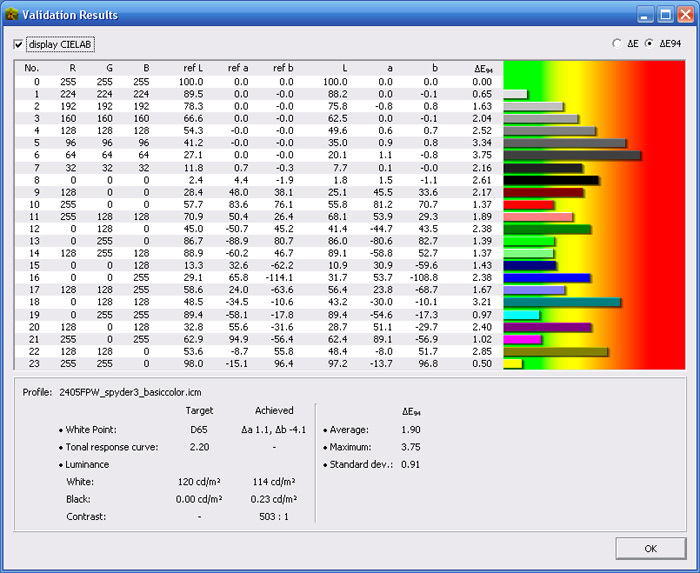 Using the Spyder3 device and their software, colour accuracy was improved to dE average of 2.4, from default of 3.6. Some improvement overall. dE Max was at least reduced from 10.7 to 6.6. Pairing the Spyder3 device with the BasICColor software allowed more accurate calibration in some regards. Luminance could be corrected much more accurately for instance. The Spyder3 device still had trouble reading the black depth properly, detecting 0.33 cd/m2 whereas the LaCie device recorded 0.23 cd/m2. Once calibrated with Spyder3 hardware / BasICColor software, the Spyder3 device thought it had achieved better results for colour accuracy than the LaCie device saw. It thought it had adjusted dE average to an impressive 0.55 whereas the LaCie tool saw it only as 3.4, actually slightly worse than if it had calibrated the screen using the Spyder3Elite software. Regardless of whether you calibrate the screen with the LaCie or BasICColor software, the LaCie hardware device delivers better results with dE average of between 0.44 and 0.6, depending on which software report you follow. 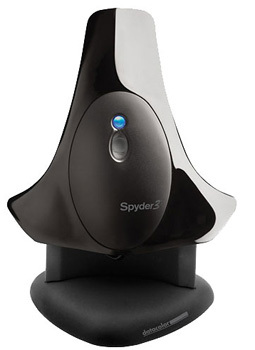 Overall then, pairing the Spyder3 device with third party software can help correct the luminance value of the screen more accurately than Spyder's own software. However, the device has trouble reading black depth properly it seems. It also can't really help improve the colour accuracy if we follow the results of our control devices and software. As such, it seems it is most likely the hardware device itself which is the limiting factor here in performance. The Spyder3Elite package was quite comprehensive, and I felt it made some nice improvements since the Spyder2 series. Firstly the design and appearance were far more pleasing to the eye than the Spyder2 was, and the device looked quite fancy sat on the desk in the cradle. 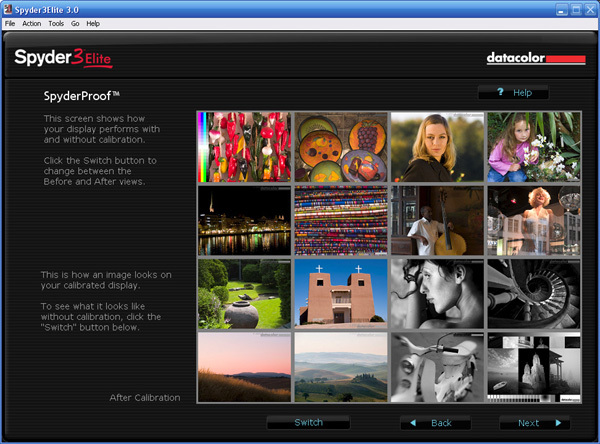 DataColor have made some nice improvements spec wise, and the software package provided was also quite easy to use. I should also add that the 'help' contents was decent and thorough and should make operating this device easy for all potential users. From a results point of view, the Spyder3 did offer some improvements over the Spyder2 as we have shown above. Colour accuracy can be corrected quite nicely, and the process is relatively straight forward and not too time consuming. Gamma and colour temperature corrections are very good, but luminance correction still remains a problem. Adjustments are not really possible at a LUT-level it seems, so you would really have to consider an alternative software package to get the most out of your setup in this regard. If you observe the results from the BasICColor software, you can see luminance was much more accurately corrected there. While colour accuracy was improved quite nicely, and certainly colours were evened out well, it still remained a way off what is possible with higher end devices. Calibration with other tools and software shows that the control display used here is capable of more, and it is not something which you can quite achieve with the Spyder3 device, regardless of whether you use the supplied software, or third party offerings. The RRP of the Spyder3Elite package is $279 USD / €215,00 which puts it at a pretty high price tag, especially when you consider the X-rite i1 Display 2 package is retailing at $249, and is very good. The Spyder3 package does offer some nice features for reporting (to a degree), along with plenty of configuration and set up options. You are missing full dE graphs which you get from LaCie's package, but then this comes at an even higher cost, and isn't something included in many calibration packages to be honest. If you are looking for an easy to use device with plenty of different options, and don't mind sacrificing a little bit in terms of actual colour accuracy results, the Spyder3 package is worth a look.